NATIONAL prankster Lee Nelson – the man who handed Prime Minister Theresa May a P45 – is making a welcome return to the Palace Theatre. Such has been the success of the comic’s show that added an extra 30 dates to his 150-night run. When he’s not sneaking into places he shouldn’t be, Lee’s live on stage with his sensational Serious Joker tour. 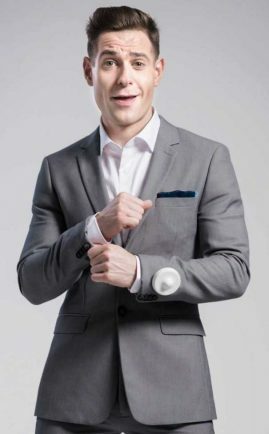 From council estate to comedy and entertainment king, Lee Nelson is the star of hit shows Well Good Show and Well Funny People. With five sell out tours to date and a host of appearances on Live at the Apollo, he’s also one of the biggest stand up stars in the country. The character is the creation of Simon Brodkin who, along with also appearing as Premier League superstar Jason Bent and dodgy medical practitioner Dr Bob, is the world’s best-known prankster as shown in his Channel 4 documentary Britain’s Greatest Hoaxer. To date targets have included: Sepp Blatter, Britain’s Got Talent, Kanye West, Manchester City, Donald Trump, Philip Green and most recently Theresa May.